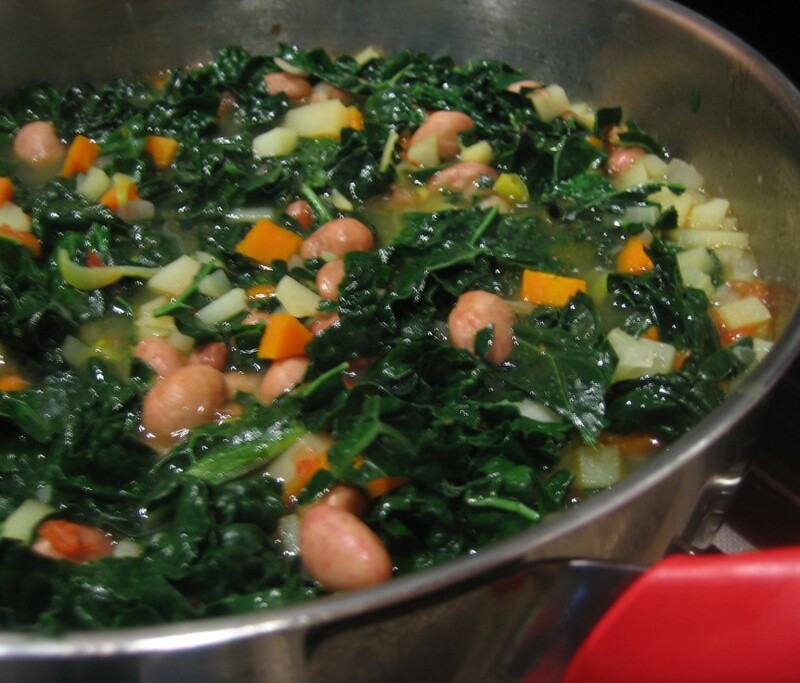 There’s often confusion as to what ribollita should actually be like. It’s not like minestrone, as it isn’t brothy and it has no pasta in it. It’s actually more like pappa al pomodoro, as it’s thick and based on bread. It’s very much Italian ‘peasant food’ and would have been eaten a lot in the days of no central heating and lots of hard manual labour. I think this recipe embraces the heart and soul of what peasant cooking is all about – cheap, tasty power food. Please do make it and reheat it the next day – you’ll find the flavours intensify. Add your fresh or dried and soaked beans to a pan of water with the bay leaf, tomato and potato – this will help to flavour the beans and soften their skins. Cook until tender – taste one to check they’re nice and soft. Dried beans can take up to an hour, but check fresh ones after 25 minutes. Drain (reserving about half a glass of the cooking water), and discard the bay leaf, tomato and potato. Finely chop your onions, carrots, celery and garlic. Heat a saucepan with a splash of olive oil and add the vegetables to the pan with the ground fennel seeds and chilli. Sweat very slowly on a low heat with the lid just ajar for around 15 to 20 minutes until soft, but not brown. Add the tomatoes and bring to a gentle simmer for a few minutes. Add the cooked and drained beans with a little of the water they were cooked in, and bring back to the boil. Stir in the sliced cavolo (it will look like loads, but don’t worry as it will cook down), then moisten the bread with a little of the cooking water and stir it in too. The soup should be thick but not dry, so add a little more cooking water if you need to loosen it. Continue cooking for about 30 minutes – you want to achieve a silky, thick soup. Season the ribollita with salt and pepper and stir in 4 good lugs of good-quality Tuscan extra virgin olive oil before serving to give it a glossy velvety texture. Serve on a cold winter’s day with lots and lots of Chianti!